Accidentally deleted or formatted your CF card? CF card gets corrupted and files are not accessible? Need to recover lost data from CF card? This post gives solutions to get back lost files from compact flash card using free CF card recovery software. CF (Compact Flash) card is a kind of popular memory cards, which is widely used on various digital devices. Compared with other memory cards such as SD card, CF card provides larger capacity and faster speed. It is preferred by digital camera users. CF card brings about great convenience in this digital world, however, its users still have to experience some problems such as photos gets deleted by mistake, CF card gets corrupted. Therefore, CF card recovery has becomes a heated topic recently. Is it possible to recover lost data from CF card? The answer is YES. When a file is deleted from CF card, the entry of the file gets deleted from directory, but the actual file data is not wiped. Since the entry gets deleted, system cannot locate the file data and tags space as Free. Hence, we cannot view the deleted file either even though the file still stays on the CF card. The recovery of deleted files from CF card is available until deleted file gets overwritten. That’s why it is important to avoid data overwriting when you realize data loss issue. The best way to help you get rid of CF card data loss issue is to download CF card data recovery software and perform CF card recovery on your own. What is compact flash card? CompactFlash (CF) card, first manufactured by SanDisk in the year 1994, is a flash memory mass storage device used mainly in portable electronic device. Likewise other flash-based storage devices, CF card is based on NAND flash memory, which made the original design of CF card relative large. Nowadays, CF card is still popular among many professional devices and high-end consumer devices. Accidental deletion: There are many cases that users delete files by accident; for example, you may press Delete button while view photos on camera, or press Delete All button to delete all images. Unintentional formatting: When you attempt to format some other drive, but failed to select correct drive and format memory card by mistake. Interruptions during data transferring: System shuts down or power fails during transferring photos from CF card to computer, which causes data loss; error occurs during Cut & Paste process. Virus attack: Memory card tends to infect virus and malware, for they often used on different computers to transfer data. Bad sectors: Bad sectors are not accessible or writeable due to logical or physical damage. Improper operations: Some users used to remove USB drive from PC directly without clicking Remove Hardware icon, or take out memory card from portable digital device without powering off. Free CF card data recovery software can help you recover all lost data from formatted or corrupted CF card. 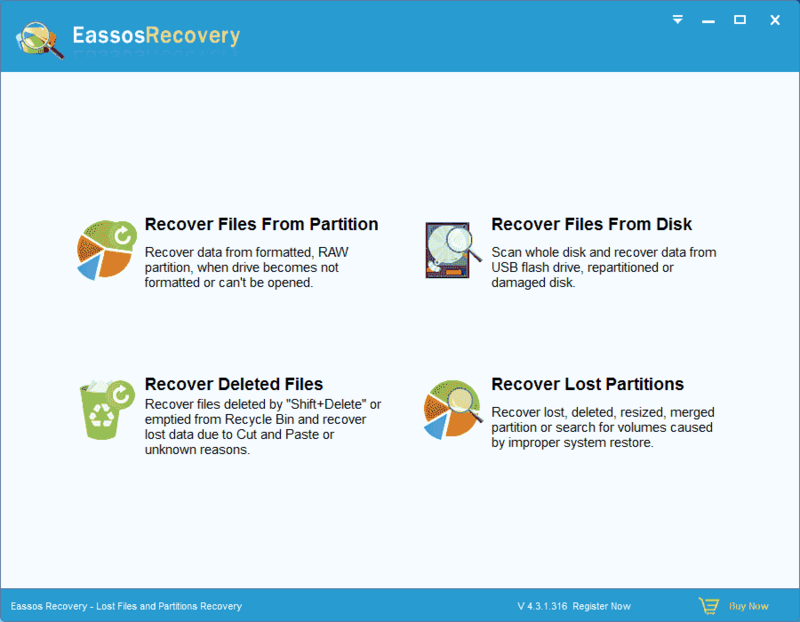 Eassos Recovery Free is straightforward and offers full data recovery solutions. It uses a wizard-style interface which makes it very easy to retrieve data from memory cards, hard drive, external hard disk, SD card, flash memory, etc. Recover all types of files including photos, video, audios, email, documents, archives, apps, etc. Recover deleted files from SD card, CompactFlash card, USB flash drive, local hard disk, external hard drive, etc. It is supportive of data recovery from NTFS/FAT32/exFAT/FAT16/FAT12 partitions. How to recover lost/deleted files from compact flash card? Step 1: Connect your Compact flash card to computer. First of all, you should insert the memory card where you want to recover data to your computer and make sure it can be recognized by Windows. 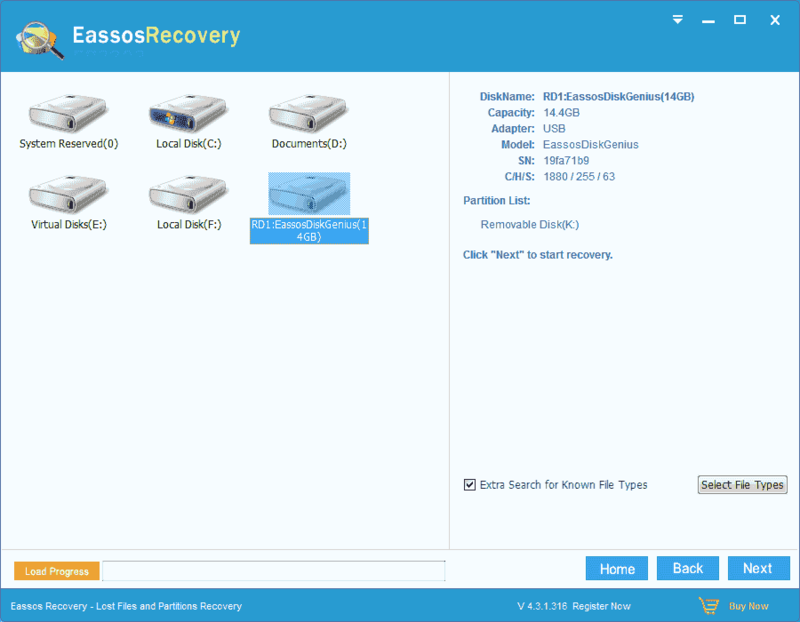 Step 2: Install and launch Eassos CF card recovery software from your computer and select proper recovery mode based on data recovery causes. 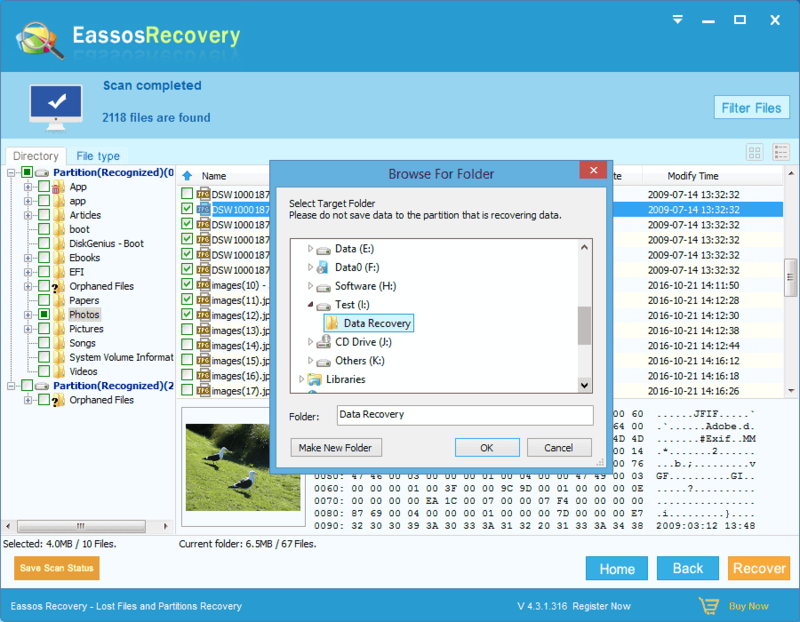 This recovery software offers four recovery options which guarantee you can deal with all kinds of data loss issues. Here you need to select the correct mode in line with the data loss causes. Step 3: Scanning the CF card for lost data. Select the CompactFlash card and click Next button to scan the memory card for lost data. The option “Extra search for known file types” should be selected so that the software performs deep scanning and finds out more recoverable files. Step 4: Preview recoverable files. You can click “Preview” to open the file in preview window and check file content in its original size. In his way, you can judge whether your files can be recovered correctly. Step 5: Recover lost files from Compact Flash card. Select files and folders you want to recover and click Recover button, and you can select a location which is different from the memory card and save recovered data. Stop writing data to the CF card once you realize data loss issue appears. If you continue taking pictures or store data to the CF card after data loss, lost files are likely to be overwritten. Do not format the memory card even though Windows prompts you to do so. A corrupt memory card is not accessible and operating system usually asks users to format it. Please ignore the message before lost files are successfully recovered. Do not run Chkdsk command on corrupted memory card, which usually cannot repair errors and even damages file directory. 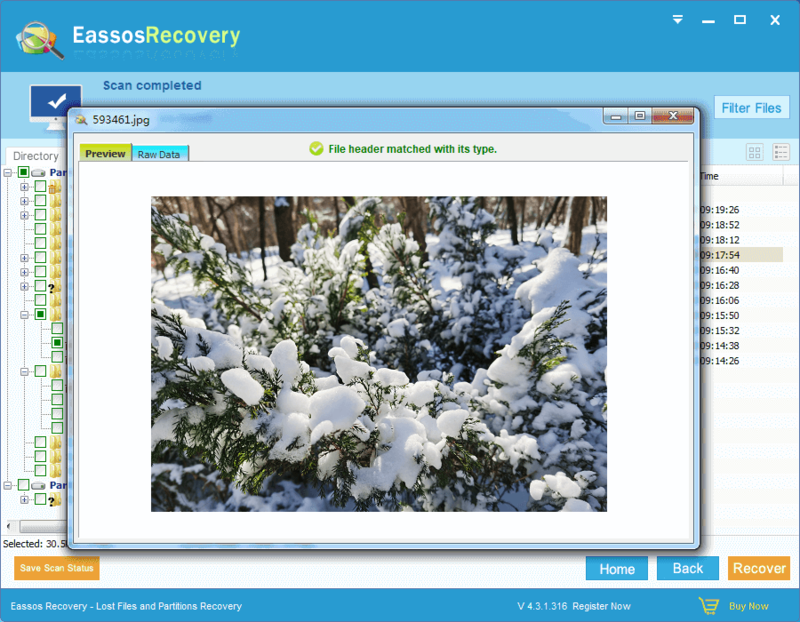 Use professional memory card recovery software to do the recovery thing and download the software from official website. Do not try any cracked application. Compact Flash card is regarded as more reliable than other memory cards, but it is not immune to data loss issue. Fortunately, it is possible and easy to get back lost data from CF memory card, SD card, flash drive, hard disk, external HDD and so on. Hope you find this CF card recovery guide useful and you’ll be able to recover lost data from memory card and flash drive by yourself. How to recover files from corrupted CF card? How to recover deleted images/photos from memory card? This entry was posted in Data Recovery and tagged CF card recovery, compact flash card, compact flash data recovery, flash drive recovery by EASSOS. Bookmark the permalink.